These muffins are mostly complex carbohydrates. Serve them with some eggs or lean turkey sausage for added protein and fat to make a balanced meal. Dysphagia Level 3 – Soft – omit peanut butter on top of muffins and bake as is. Top with honey or pure maple syrup when ready to be eaten. Combine flours, flaxseed, brown sugar, baking soda and baking powder in a medium bowl and set aside. Mix yogurt, mashed bananas, egg, and egg white in a large bowl. Add dry ingredients and mix until well incorporated. Batter will be thick. Add in milk one tablespoon at a time until batter slightly thins. Spoon batter into muffin tin, filling each cavity about 3/4 of the way full. 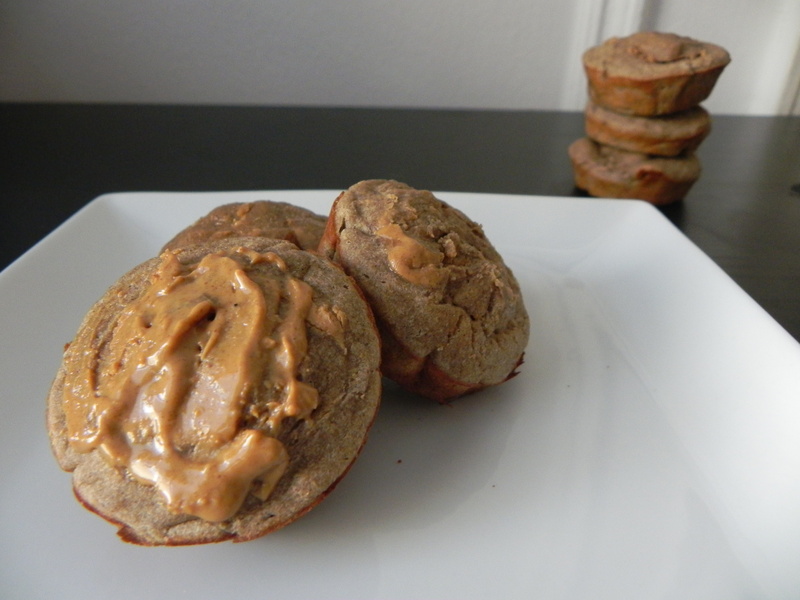 Swirl peanut butter evenly on top of each muffin. Bake for 12-15 minutes or until toothpick inserted into the muffins comes out clean. Cool muffins on a wire rack.